The Easiest Way Ever to Support Our Center! Do you shop? Rather than using cash or credit to pay for your regular household purchases, use scrip gift cards and a percentage of what you spend will be given to The Sanctuary for Spiritual Living. From grocery stores, to discount stores, to clothing stores, to entertainment, and all sorts of specialty retailers, you name it, we've got it! We place orders on the 1st Sunday of each month, and they are available for pickup the next week, after the Sunday morning services. Order forms can be found in Harmony Hall, or call Terri Thayer at (626) 332-6838. Thank you for supporting this fundraising activity. See below for a list of available gift cards. 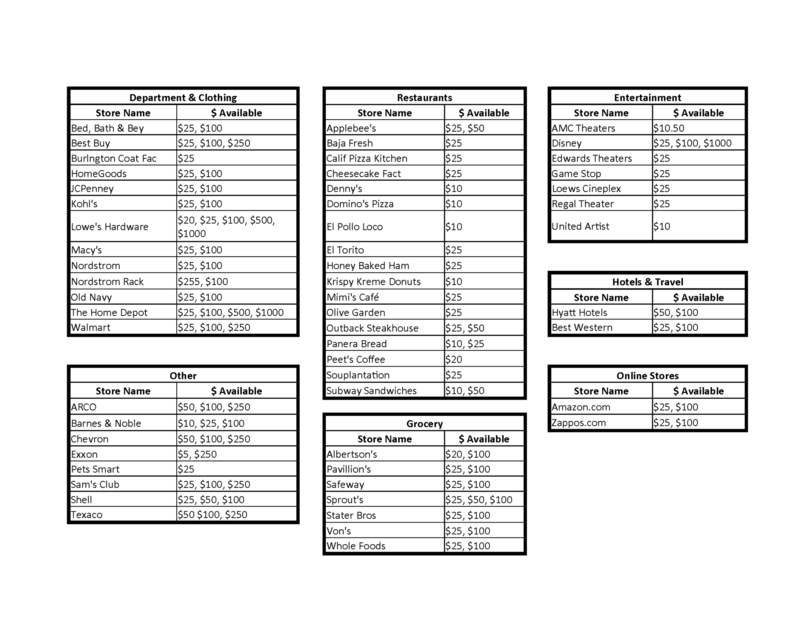 See below for a partial list of available gift cards. For a complete list, contact Terri Thayer or request a list in Harmony Hall.